Whale Shogi is a variant of Shogi, Japanese chess. However, unlike most other Shogi-variants, Great Whale Shogi roots are not in Japan, but in the U.S.A. It was invented in 1981 by R. Wayne Schmittberger (the author of New Rules for Classis Games; however, he does not mention Great Whale Shogi in this book). As is more common in shogi variants, the inventor has named all pieces after a kind of animal: in this case all are whales and related animals. The game rules were obtained privately as this game's rules were never posted until now. It is a complicated 11x11 big brother to R. Wayne Schmittberger's other game, Whale Shogi. 'Around the same time  as I designed Whale Shogi, I also created a really complicated 11x11 'Great Whale Shogi', inspired by Wa Shogi. Each of the 28 pieces per side is different and has a different promotion; and even the pawns are unique calves that promote to the type of whale found in their file. '-R Wayne Schmittberger. White White whale 6a; Bowhead 1a; Bottlenose Dolphin 2a; Rough-toothed Dolphin 3a; Sei 4a; Minke 5a; Fin 7a; Bryde's 8a; Harbor Porpoise 9a; Dall's Porpoise 10a; Black Right 11a; Sperm whale 3b; Northern Bottlenose whale 6b 9c; Humpback 9b; Pilot 3c; Killer whale 6c; Calves- Bowhead 1c, Bottlnose Dolphin 2c, Sei 4c, Minke 5c, Fin 7c, Bryde's 8c, Dall's Porpoise 10c, Black Right 11c, Pilot 3d, Killer whale 6d, Nothern Bottlenose 9d. Black White whale 6k; Bowhead 11k; Bottlenose Dolphin 10k; Rough-toothed Dolphin 9k; Sei 8k; Minke 7k; Fin 5k; Bryde's 4k; Harbor Porpoise 3k; Dall's Porpoise 2k; Black Right 1k; Sperm whale 9j; Northern Bottlenose whale 6j 3i; Humpback 3j; Pilot 9i; Killer whale 6i; Calves- Bowhead 11i, Bottlnose Dolphin 10i, Sei 8i, Minke 7i, Fin 5i, Bryde's 4i, Dall's Porpoise 2i, Black Right 1i, Pilot 9h, Killer whale 6h, Nothern Bottlenose 3h. Movement of standard pieces The White Whale: moves as a king, i.e., one square in any direction. The Bowhead Whale: slides straight forward or moves 1 space backwards or leaps/jumps 2 spaces backwards. Promotes to Dwarf Minke Whale. The Bottlenose Dolphin: moves one square diagonally forwards or backwards or jumps/leaps to the 2nd square orthogonally, up, down or to either side. Promotes to Killer Whale. The Rough-toothed Dolphin: moves one square backwards, or jumps/leaps to a 2nd square diagonally forward or straight forward. Promotes to Sperm Whale. The Sei Whale: moves one square diagonally forward or jumps/leaps to 2nd square directly backward. Promotes to Pygmy Killer Whale. The Fin Whale: moves one square in any direction except directly forwards or backwards. Promotes to Cuvier's Beaked Whale. The Minke Whale : moves one square in a direction except to either side. Promotes to Giant Bottlenose Whale. Bryde's Whale: moves one square diagonally backwards or one square directly forwards or leaps/jumps 2 squares directly forwards. Promotes to Pygmy Sperm Whale. The Harbor Porpoise: moves forward one square or moves FORWARD ONLY like a Chess Knight, but farther. Instead of leaping 1 + 2 squares, it leaps 2 + 3 squares. It can also move backwards one square. Promotes to Humpback Whale. Dall's Porpoise moves one square orthagonally or jumps/leaps to the 2nd square diagonally. Promotes to Narwhal. The Black Right Whale: slides straight north, leaps/jumps to the 3rd square to the sides, or moves straight back one square. Promotes to False Killer Whale. The Sperm Whale: slides in any direction except straight forwards or diagonally backwards. Promotes to Blue Whale. The Humpback Whale: slides in any direction except diagonally forwards or straight backwards. Promotes to Gray Whale. The Pilot Whale: moves one square in any orthagonal direction. Promotes to Pacific Northern Right Whale. The Northern Bottlenose Whale: moves one square in any diagonal direction. Promotes to Beluga Whale. The Killer Whale: moves one square in any direction except due south. Also has 'Chu-Shogi' type 'Lion Power' in the 2 forward diagonal directions (NE and NW), That is, it may move to either the first or leap to the second square in that direction, with or without making a capture. However, it may capture a piece on the 1st square and then go on to the adjacent 2nd square, without or without capturing a piece there. It can also capture a piece on the 1st square and then move back to its square of origin (Igui type capture). This last type of capture is almost as if it didn't move. Does not promote. Movement of Calves Calves move 1 space forward and behave like a Shogi Pawn. However each calf is tied to a particular type of whale adult that it promotes to. The adult version behaves the same way as described above. The 11 calves are for the Bowhead , Bottlnose Dolphin, Sei, Minke, Fin, Bryde's, Dall's Porpoise, Black Right , Pilot, Killer whale, and Nothern Bottlenose whale. Promotions The promotion zone are the the 3 farthest rows from the starting area of each side. If moving into or from the promotion zone, the particular piece in question has the option to promote to its promotable piece or to stay unpromoted. If a calf reaches the farthest enemy row, however, the promotion is mandatory. Once promoted, a piece cannot demote unless it is captured in which case the opponent now controls it off board and it is in its demoted state. Movement of Promoted Pieces Adult versions of the calves, move as described above. The Dwarf Minke Whale: promoted Bowhead Whale. moves one square in any direction except it also slides diagonally backwards. The Killer Whale: promoted Bottlenose Dolphin. See above for movement. The Sperm Whale: promoted Rough-toothed Dolphin. See above for movement. The Pygmy Killer Whale: promoted Sei Whale that moves one square or leaps/jumps 2 squares in any diagonal direction. Cuvier's Beaked Whale: promoted Fin Whale that moves one, or leaps two squares, diagonally forwards or backwards or moves one or leaps two squares directly to either side orthagonal side. Giant Bottlenosed Whale: promoted Minke Whale that moves one or leaps two squares orthogonally forwards or backwards or moves one, or leaps two squares, diagonally forwards or backwards. The Pygmy Sperm Whale: promoted Bryde's Whale that moves one square or leaps/jumps 2 squares in any orthogonal direction. The Humpback Whale: promoted Harbor Porpoise. See above for movement. The Narwhal: promoted Dall's Porpoise that moves one square in any diagonal direction or jumps/leaps 3 squares straight ahead. The False Killer Whale: promoted Black Right Whale. Moves 1 square in any direction. The False Killer Whale may capture up to three pieces at once if they lie in the three squares directly straight ahead, all in one turn, or it may capture just some of them. It may capture a piece on its 1st square without really moving (Igui: It may move one space forward and then directly backward). It may move direclty to the first, second or third square without making a capture. It may capture at the first square and/or the second and then go on to the third (where it may or may not make a capture). It may capture at the first square, go on the second without making a capture, and stop. It may capture at all 3 squares, winding up at the third square. If capturing a piece on the second square, it cannot Igui backtrack to the first square. It must end movement on the second square or go on to the third where it may or may not capture. The Blue Whale: promoted Sperm Whale that moves one square diagonally and then any number like a queen in the eight directions. It can also stop after the first square diagonal movement if it wishes. Since it cannot jump, the first diagonal square must be empty for it to spring forth in the 8 directions. The Gray Whale: promoted Humpback Whale that moves like a Chess variant piece called the 'Nightrider' in that it can move directly to any square that a knight could reach by making one more more knight moves in a straight line, provided however that the Knight would at no time land on another piece (except at the final destination when making a capture. The Northern Pacific Right Whale: promoted Pilot Whale that can leap/jump 2 squares in any of the eight directions. The Beluga Whale: promoted Northern Bottlenose Whale that can move one square in any direction and stop or it can make an Igui! move by moving to one square in any direction, capturing a piece there, and returning to the original space it came from. The object of the game is to the check-mate/capture the opponent's White Whale. Captured pieces are reused as in shogi. 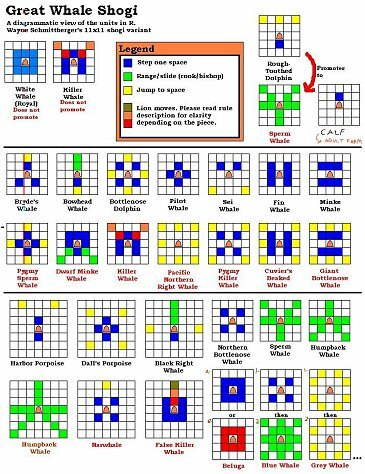 Pawns are 'Calves', which move exactly like Shogi pawns, but have a variety of different promotions; specifically, each pawn promotes to the type of piece immediately behind it in the initial setup.' -RWS. As in Shogi, pieces taken from the opponent can be used as reinforcements: instead of making a normal move, a player can put one of the pieces he took earlier in the game from the opponent, and put this piece on an empty square; it is now one of his own pieces. There is one special rule about drop. One may not drop a calf on the last row (at the enemies side of the board), to give checkmate, or on a column that already contains a calf belonging to that player. The player that check-mates or takes the white whale of the opponent wins the game. The Killer Whale, Promoted Black Right Whale (The False Killer Whale), and the Promoted Nothern Bottlenose Whale (The Beluga Whale) all have lion power from Chu-Shogi in certain directions; specifically, they can capture an adjacent piece and either return to their original space or move on and capture the 2nd piece, or a 3rd in the case of the False Killer Whale. These pieces along with the faster movers like the Humpback Whale, Sperm Whale, and the Harbor Porpoise, will be the brunt of usual attacks. After capturing opposition pieces that promote to superstar pieces (such as the promoted Sperm Whale which becomes a double moving chess-Queen like Blue Whale), just drop these pre-superstars in the enemy promotion zone, move them, and watch them shine!. Author: Douglas Silfen. Inventor: R. Wayne Schmittberger. This game, I have not noticed before and seems a neat idea but lack of pictures really makes move remembering difficult :(!